On the evening of Sunday October 28, 1958 two friends* were out driving in the outskirts of the city of Baltimore, Maryland, at about 10.30 p.m.The winding road took them past Loch Raven Dam on an allegedly dark, moonless, clear and starry night, bereft of any bright planets. No wind eras reported so that calm conditions likely prevailed. No information is given in the original report by Jacques Vallee concerning the existence of human habitations or street lights (except that staff in a ‘nearby’ restaurant heard an explosion at 10,45 p.m.) but of course there is always some light in the vicinity of any large town. Nor is any such information available in the more recent treatment by Hynek (2), who incorrectly places the reservoir in Delaware (Appendix I, p 239). Neither of these authors offers any explanation for the UFO sighting which the two friends Mr C and Mr S, then made as they approached the first bridge across the lake. The case is presented as yet another mysterious item of alleged UFO evidence. Rounding a right-handed bend they approached the bridge from a northerly directions with a cliff on the left and the water to their right only to see, floating above the bridges a mysterious and alarming “egg-shaped” object about 100 feet in diameter and about the same in height at an estimated 75 to 100 feet above the superstructure of the bridge, a modified Pratt truss steel structure about twenty feet high at the top points of its two independent spans. Thus the UFO was, according to Messrs C and S, one hundred feet or more off the ground at roadway levels though it seems likely that this figure was an overestimate. On first noticing the hovering UFO the men were travelling at between 20 and 30 m,p.h. at a distance of some 200 to 300 yards from the bridge, but speed was immediately reduced to around 10 – 12 m.p.h, Eventually when the car was a mere 25 yards from the bridge it suddenly stopped, the engine went dead and all the lights went out, just as well, perhaps for otherwise the intrepid friends, who thought the object might have been some sort of ‘blimp’ (balloon) would have found themselves on the bridge more or less immediately under the UFO! After a further lapse of about half a minute during which they were now “terrified” (S) the UFO which had “been glowing with an irridescent glow” seemed to flash “a brilliant flash of white light”, (C )and seemingly gave off a terrifically bright light, (S) whilst “at the same time we felt a tremendous heat wave” (S) and both “felt heat’ on our faces” (C) – but: “It didn’t seem like the heat of a burning object but something like an ultraviolet light or some kind of radiation”. (S)Concurrently with the flash of bright light there was a loud noise, described as a “dull explosion” by C and as a “tremendous thunder” by S. This was the sound heard by the other people in a ‘nearby’ restaurant. “Then very quickly, so that you couldn’t get the proper sequence of events the object started to rise vertically. The only different feature it had while it was moving was that it was very bright and the edges became very diffused so that we couldn’t make out the shape as it rose. It took from five to ten seconds to disappear from view completely. We were very frightened”. The experience had become a UFO sighting of the ‘close encounter’ type and displayed a good many familiar, awesome overtones; putting these aside however, what did the sighting amount to? The answer is simple. The UFO was a balloon, a large partly deflated balloon carrying a payload. The payload was jettisoned by the activation of an explosive charge (3) and the balloons lightened of its burden, quickly rose up out of sight. The battery on the balloon evidently run down, was unable to provide much current to the balloon’s light until after the severance when the light came on and illuminated the underside of the fabric. 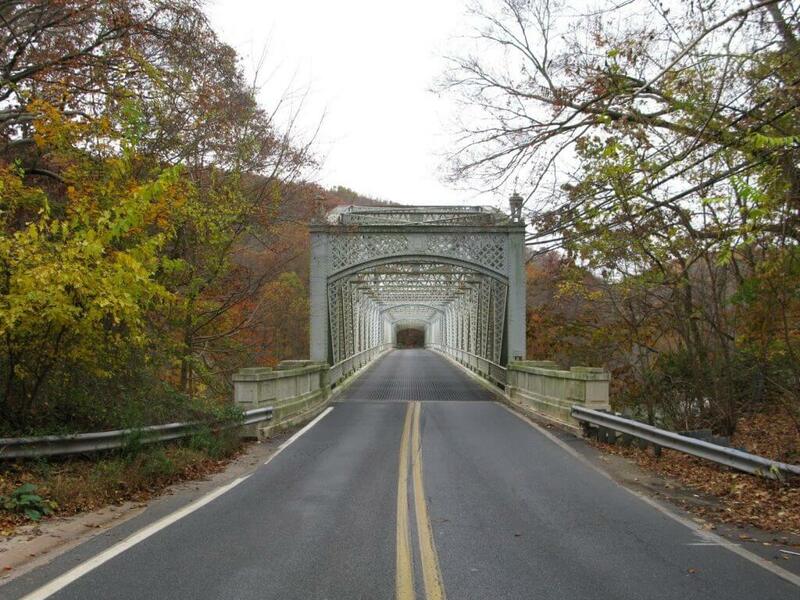 Loch Raven Reservoir bridge on Paper Mill Rd. The old bridge on the right is closed. No doubt the payloads which might already have been partially submerged, disappeared into the lake, probably. on the north side of the bridge judging from a photograph in Vallée’s book, but the men were too excited to hear any splash there may have been. Presumably this payload is still lying on the bottom of the reservoir. Someone should go and retrieve it, just out of interest. It might also be of some scrap value. As far as the car electrical malfunctioning is concerned, if Venus can perform this feat from a distance of over twenty million miles why not a balloon from a hundred feet or so? One is reminded of the case mentioned by Craig on page 761 of the Condon Report (4) where a cylindrically-shaped balloon released from Boulder, Colorado, eventually found its way to the Azores where it was sighted – and stopped all the clocks! For some reason one never reads of the most likely reason for malfunctions of car electrics, namely loose or dirty contacts and run-down batteries. Such things are common sources of failure, especially in autumn and winter. Why do the cars (often) start again after a while? Because the contacts have improved and/or batteries recover sufficiently when relieved of load for a time. My advice to ufologists? Do not take too much notice of ufological electrical failures in cars and, if you live within striking distance, go and recover the lost treasure of Loch Raven, provided the authorities haven’t beaten you to it. They may not have done so, however for the good reason that neither the USAF nor Project Blue book evaluated the sighting at the time and no-one (including Drs Vallée and Hynek) has been able to do do since. to witness an airship some 280 feet long and having a mean maximum diameter of about 80 feet (typical dimensions for a USN blimp) can be guaranteed to draw a crowd anywhere in the world. Only when the car engine died and the sights went out would their excitement become anxiety, and by then they had approached too close to the object for comfort. Assuming that the underside of the object was in some way illuminated, as the report implies, the witnesses should then have been able to discern whether the thing hovering virtually overhead had the necessary excrecences to qualify as a blimp – an underslung cabin, engine nacelles and, perhaps, large control surfaces at the rear. I suggest that when the witnesses finally clambered from, and crouched behind the car, they had become very convinced that the object was not what they had originally assumed it to be, and naturally felt extremely vulnerable with only the windscreen separating them from ‘it’. Alan Sharp’s explanation of the explosion seems attractive at first, but it is difficult to believe that so much explosive energy would be required to jettison a payload package, even one of large proportions; and surely, an airship would jettison ballast (water) to gain height. Consequently, it is my view that although the jettison idea may be just compatible with the met. balloon theory, it is an improbable suggestion for an incident involving an airship, unless the craft involved had been conducting some clandestine military experiment. Finally, I wish to deal with the subject of car electrics. During some thirteen years of motoring I have never known an electrical failure of the kind described in this report. The fact is that although such failures are not impossible, they are highly improbable. Consider the case of the faulty or run down battery. From my own experience, as soon as the engine is running above tick-over speeds, which is usually the case when the car is moving and in gear, the dynamo will continue to supply power to all the electrical equipment, even when the battery has been completely flattened. Further, since it is possible to remove the battery altogether after starting the engine, loose or corroded battery terminals seem to be irrelevant in the context of the Loch Raven report. I suggest that only a large induced back-E.M.F., a massive short circuit of the electrical supply (albeit for a short period), or an improbable sequence of faults and chance events could produce such a complete systems failure as the one described.To conclude, without the failure of the oar electrics it would be reasonable to believe that the witnesses had seen a USN airship in unusual circumstances, (The Wallops Island Naval weapons testing stationer is only 100 miles or so to the south of Baltimore, and this thought must have occurred to the Blue Book investigators) but as events stand, in my view the Loch Raven object must surely remain unidentified.